The taping of the seventh season of "High Stakes Poker" just finished filming a few hours ago. The list of players who participated in HSP7 was not officially released by GSN or POKER PROductions this year, which means that people had to turn to Twitter to find out some of the names that were participating. Prior to HSP6 taping last year, GSN sent out a press release that highlighted all of the big names that would be participating. I'm assuming that this didn't happen for HSP7 due to the fact that the line-up seemed to be up in the air right up until the last minute. 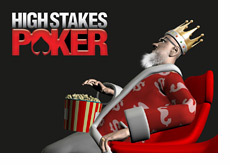 -Full Tilt Poker decided that their pros would not be participating in HSP7. This means no Ivey, no Dwan, no Antonius, etc. That's about all that we know as of right now - I guess that we'll have to wait until the shows start airing in 2011 to find out the exact list of players who participated in HSP7..